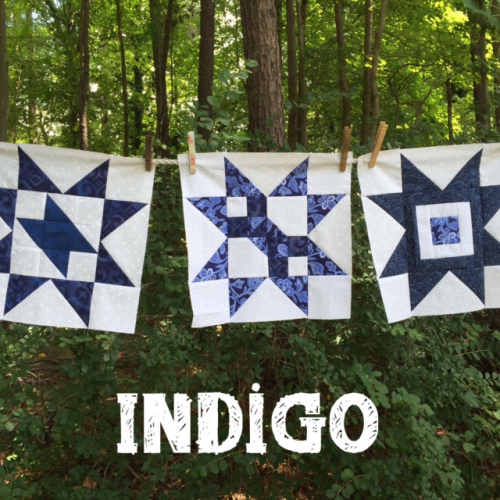 It's all about the color indigo this month. I do not have a lot indigo in my scrap stash but I managed to come up with these few blocks. They are as close as I could get to indigo. I like the Roosevelt's Bow Tie block best. It went together super fast. I like it a lot. It's shown front and center. 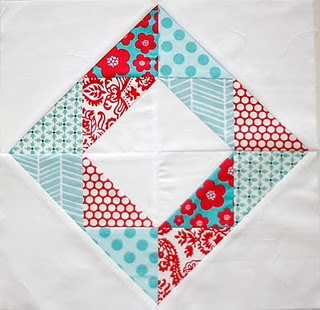 I had to do some tweaking with the cutting instructions for the center Bullseye Block for it to finish at 6 1/2 inches. It's the one on the far right. I just switched my center block to a 2 1/2 inch square and adjusted my strips accordingly. Easy Peasy. No Problem. I am using my Easy Angle and Companion Ruler for my HST's and Flying geese units. 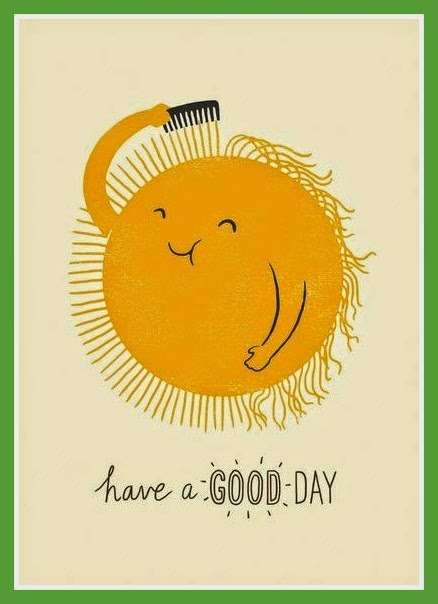 Click on over to SoScrappy to see what we're all up to this week. 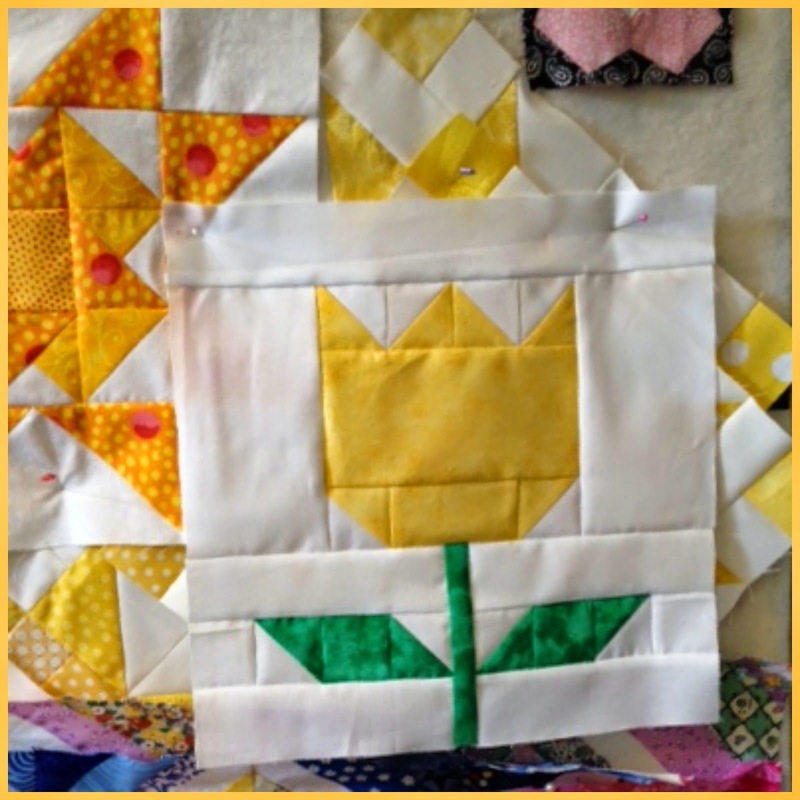 My quilting bee is also having an ongoing quilt block blitz. The rules are simply. 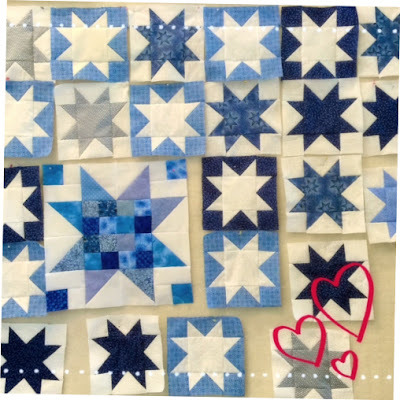 Just make Red, White and Blue star blocks. Any kind and just about any size. 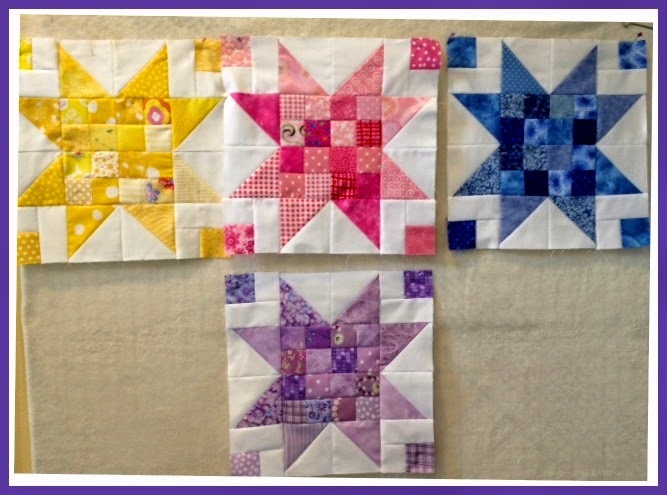 Our plan is to get together and sew them all into a few quilts to donate here locally. My design board all loaded up. I'm using a new technique I found. No-Waste flying geese. 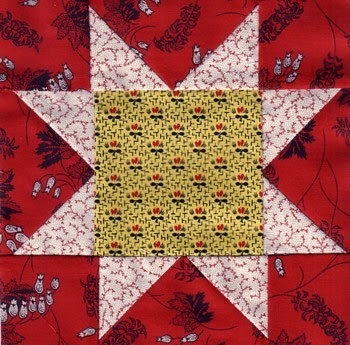 I found it at Generations Quilt Patterns website. I like it for small units. My blocks are 6 1/2 inch. 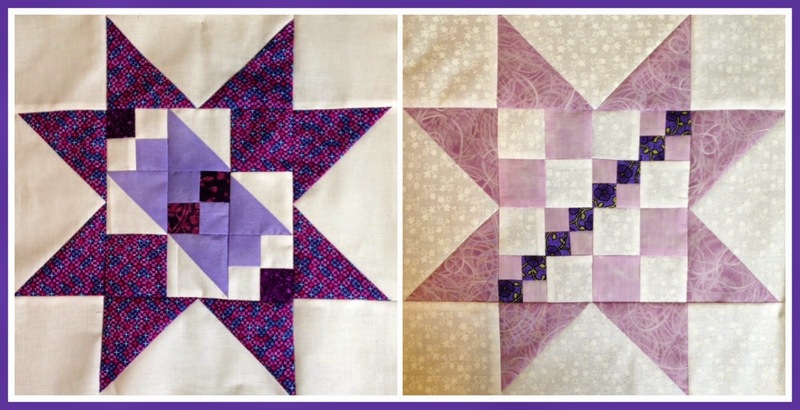 Today I am brave enough to share with you some of my Stars in a Time Warp blocks. 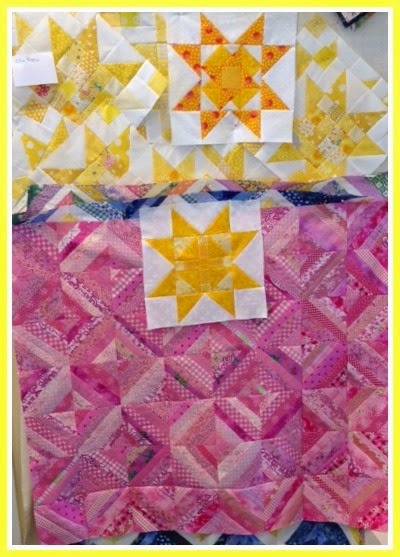 I am trying to make three blocks for each color/fabric that Barbara Brackman selects with her quilt along. 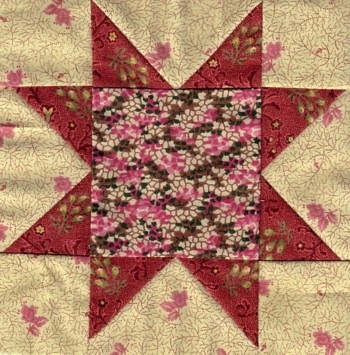 For many years I collected Civil War fabrics. I got some bug up my you know what once and decided to sell them all. 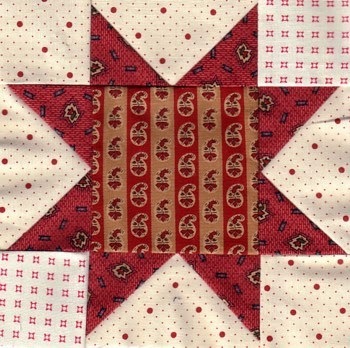 Lately, seeing of the talented bloggers showcasing their blocks, along with the Barbara Brackman's Stars in a Time Warp quilt-along, got me thinking that I really should make another Civil War quilt. 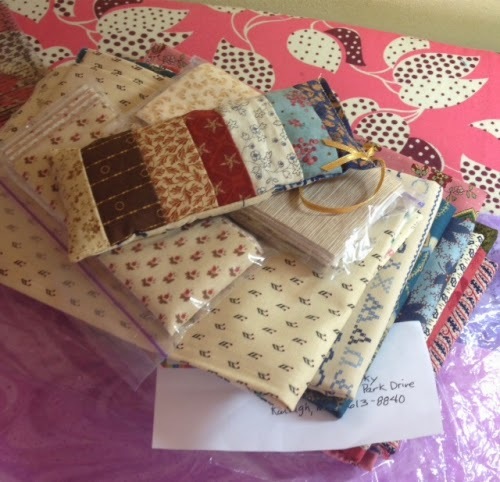 I told my friend Vic, who blogs here, that I wanted my fabrics back. She knew I was just kidding. But you know what? She sent me a fantastic assortment of prints. The purple prints she sent me are amazing. She also made me a wonderful lavender sachet which makes everything smell delightful in my sewing room. 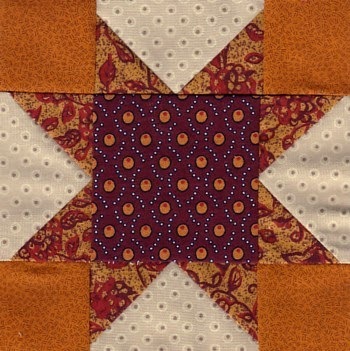 I am learning so much about the history of fabric coloration techniques, locations and history of many quilt styles. 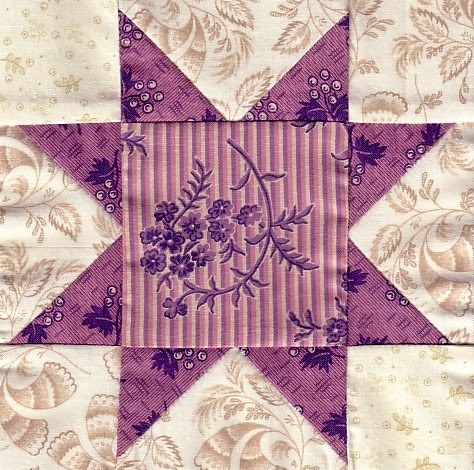 How fashions dictated what would be used in quilts at a particular time, the history of the women who created some of these marvelous treasures. 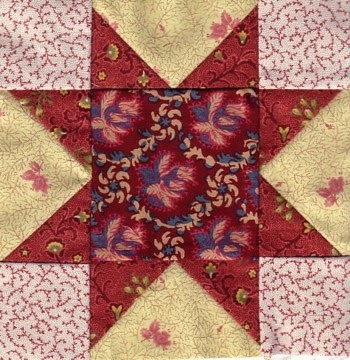 Foulard-style prints which were popular for clothing in the 1860s. 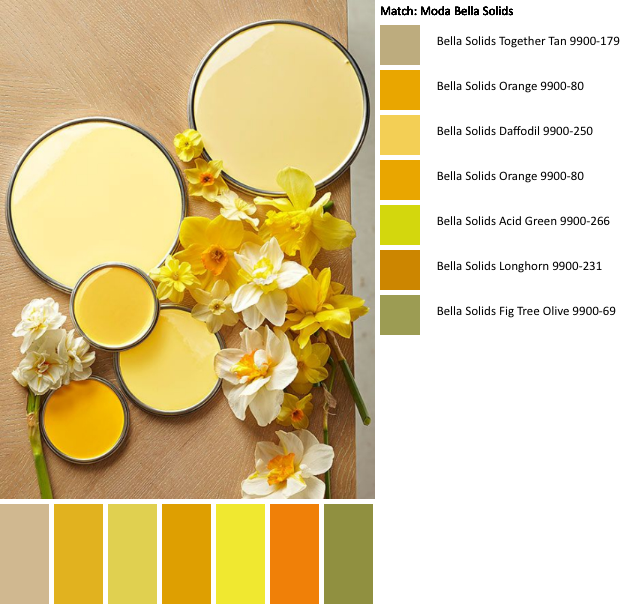 Chrome yellow which is lemon-colored. 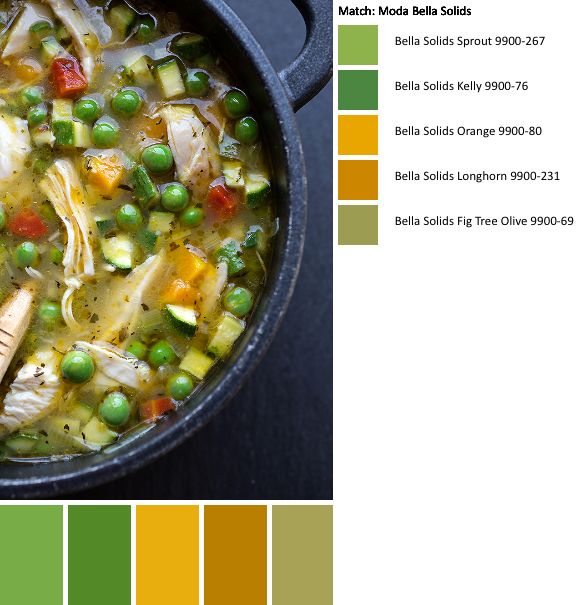 It is a very intense yellow with a slight greenish cast. 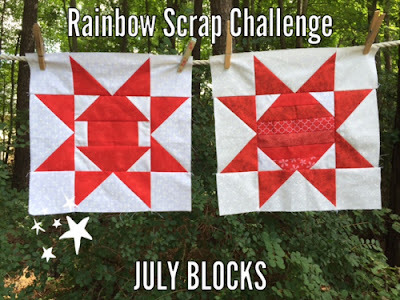 I am getting much better with my block colors Thanks to the many suggestions and taking lots of peeks at all the wonderful quilter's blogs who are also participating. 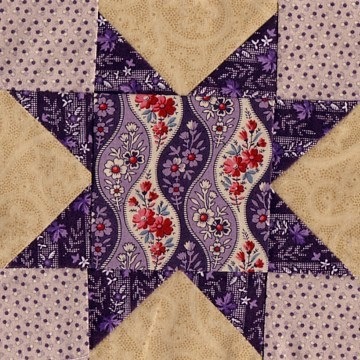 My Give-Away Ends Sunday Night for my #Spring#Sprang#Sprung packet of fabric scraps and pattern to make this block. I got the top all sewn together but it was too dark out side to take a nice picture. 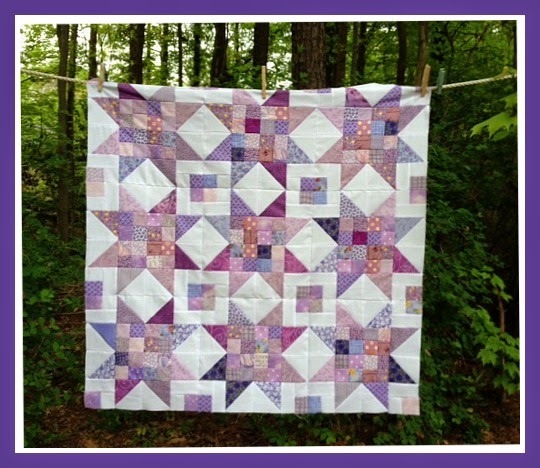 I'm joining along with all these wonderful quilters. Take a look. I am not having any problems digging into my stash for the Rainbow Scrap Challenge colors. It seems I have bits and pieces of every color in the rainbow. 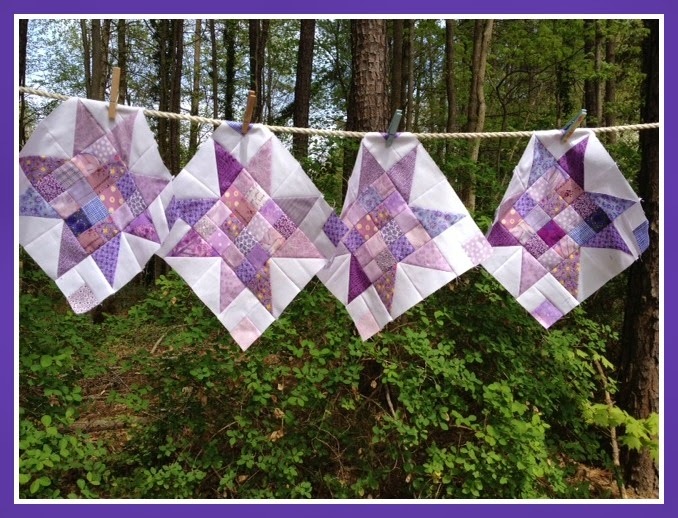 Here are my two blocks for April. You can see what all the fuss is about over here. 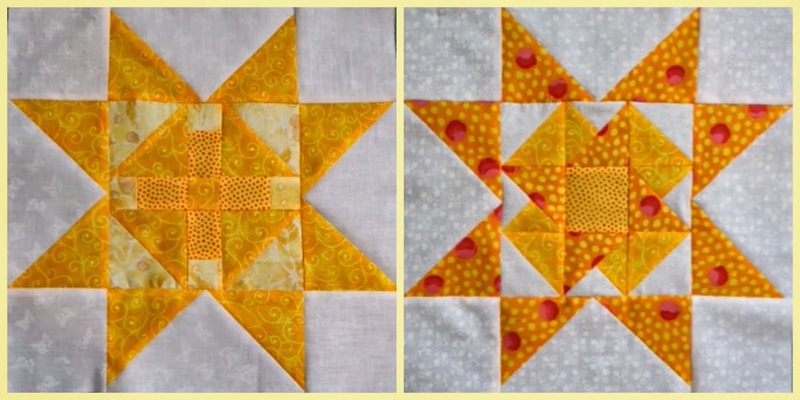 Angela works up a great tutorial for each 6 inch center block twice a month. 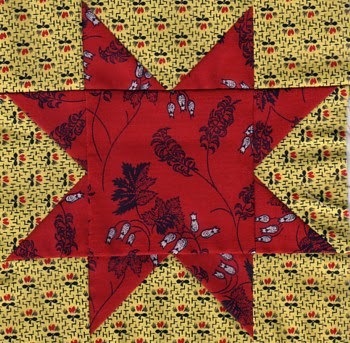 Then we finish it up with a Sawtooth star. Which when done right, should finish at 12 inches. I'm sure there will be a bit of tugging and fudging when I get to the point of putting them all together. I love it when I am super productive. 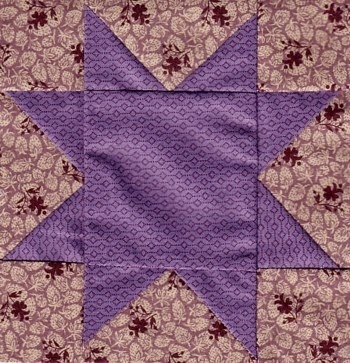 Each month I'm making a Scrap Jar Star Quilt from the designated color. 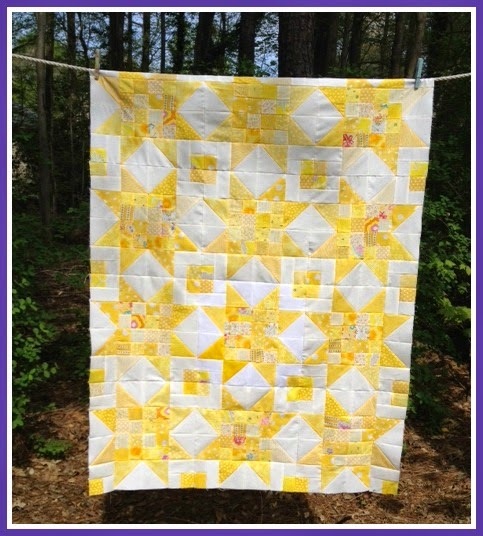 I need 12 blocks for a baby-sized quilt. 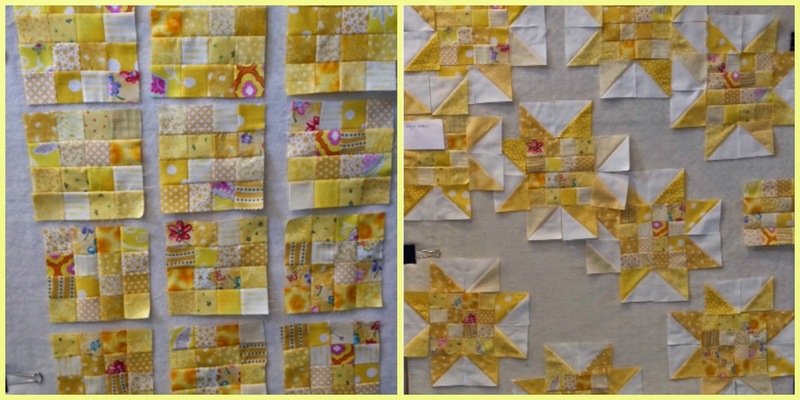 Remember all the yellow squares on my design wall from my last post? 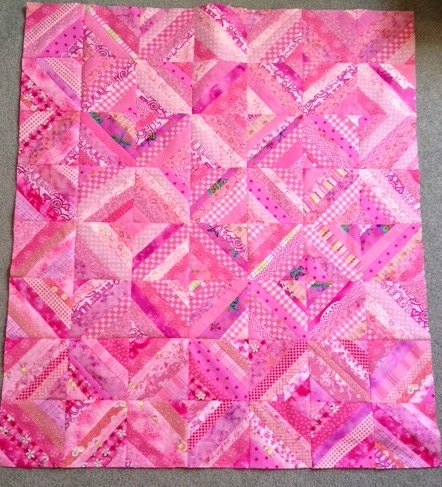 Here it is finished for March. 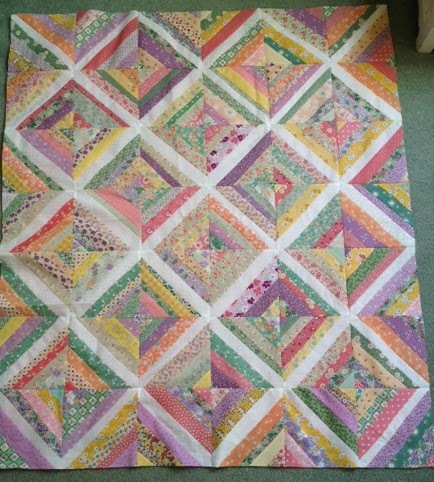 It just needs quilting. As you can see, I am on a "no border" kick. 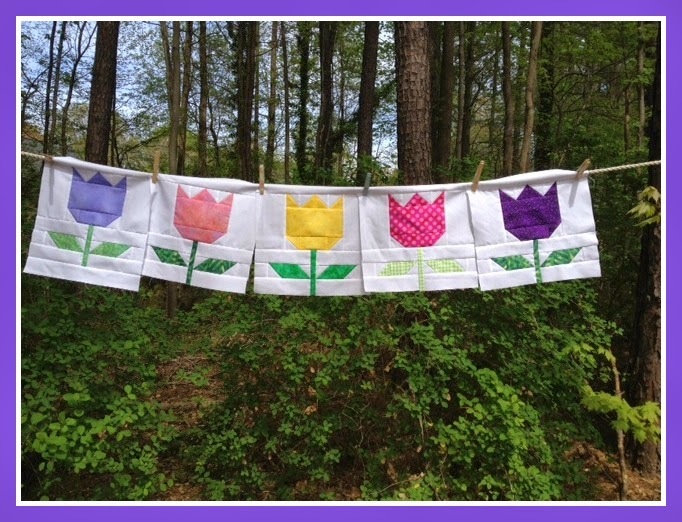 Another project I am working on are tulip blocks. These are the blocks that I have made so far. They are all strung up on a clothesline in my neck of the woods. 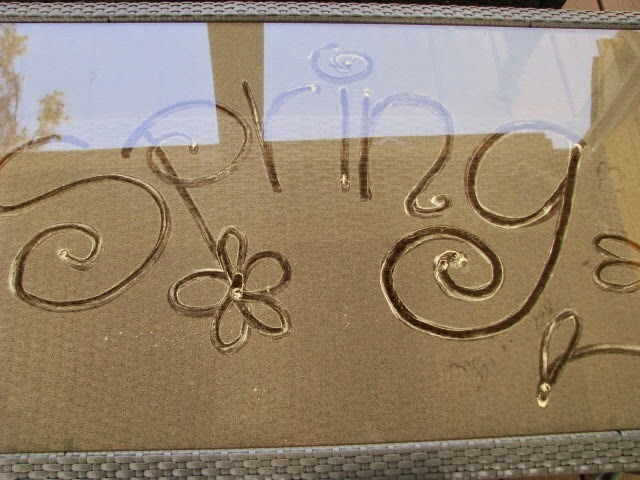 Which, by the way, is full of pollen. What a minute! I see two mistakes. Oops. 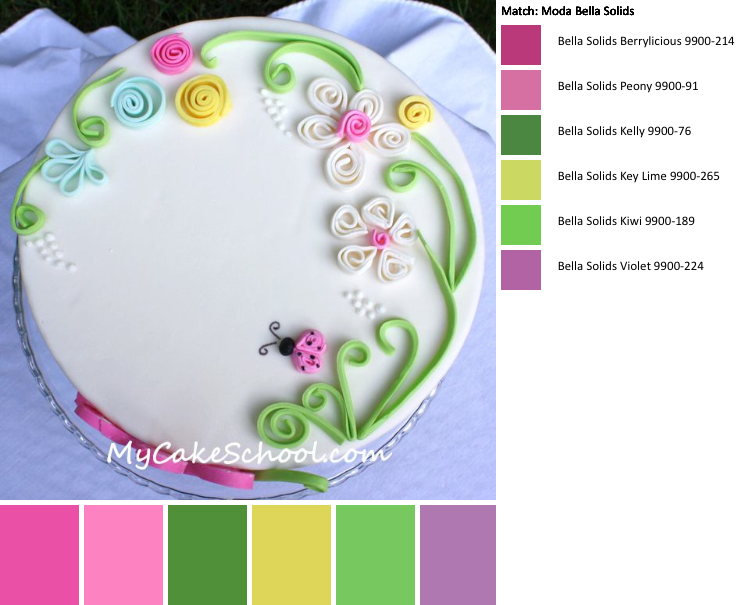 This is a super quick and easy block finishes at 12 inches. 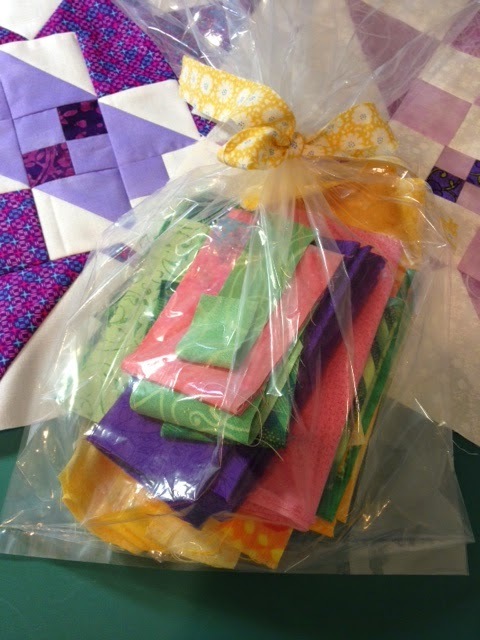 I'm giving away a fun little packet of fabric scraps and the pattern to make three block: pink, purple and yellow. 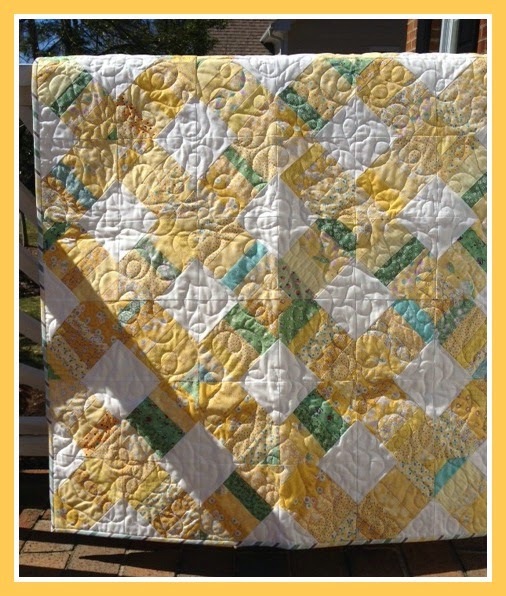 Leave a comment and we'll see who gets to be the lucky quilter. Well it's started. The ACC Basketball Tournament March Madness is here! I heard a little news trivia this morning that businesses lose $2 billion in lost employee productivity during the playoffs. You can't get away from it. Here is my March Madness version. My design wall. It's loaded with projects. I layered it as I completed each project this weekend. 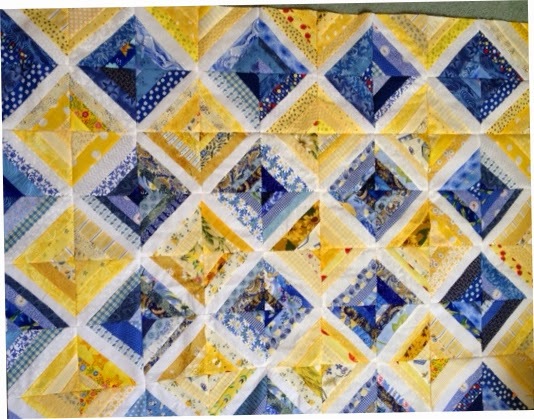 A few years back I made a bunch of small string quilts. They really were too small to be of any use. So, I made them bigger. They're now about 40 x 45. I headed off to Jo-Ann Fabrics today and bought a huge roll of batting. 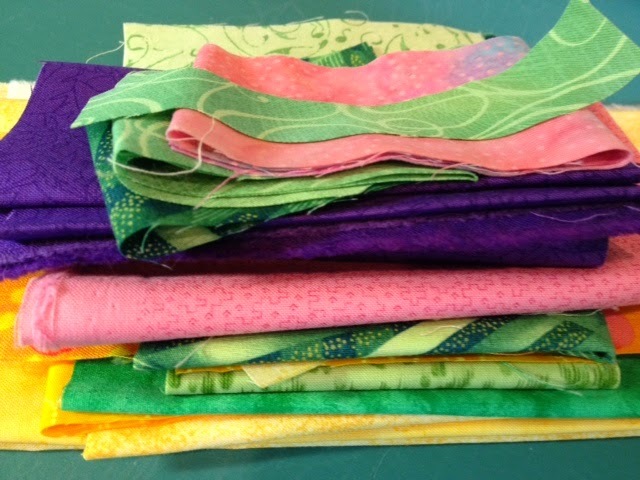 Gonna knock these out along with other quilts are just piling up. 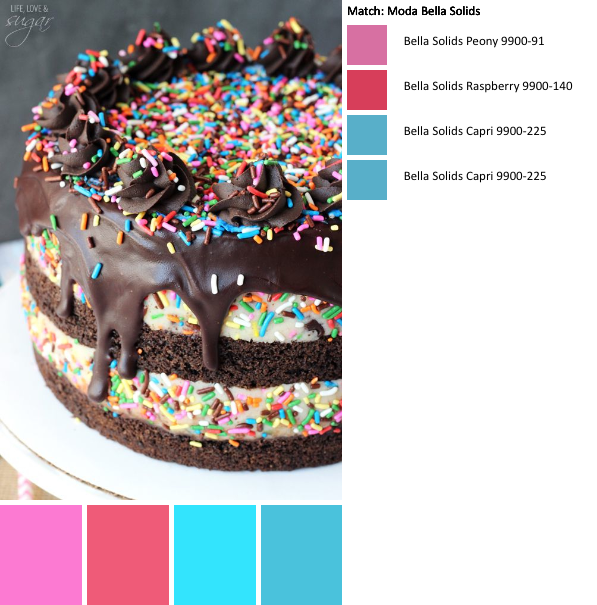 Color Monday's theme is birthdays. 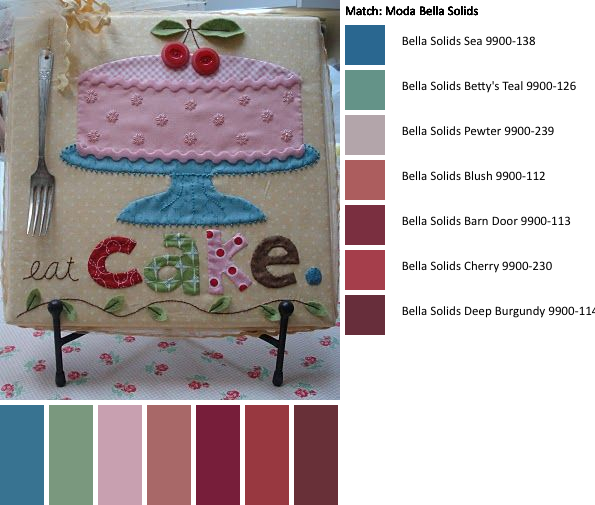 I'd take any of these cakes for my birthday. What happened to our glorious sunshine from this weekend? I have to admit to you all that I am a bit weather obsessed. 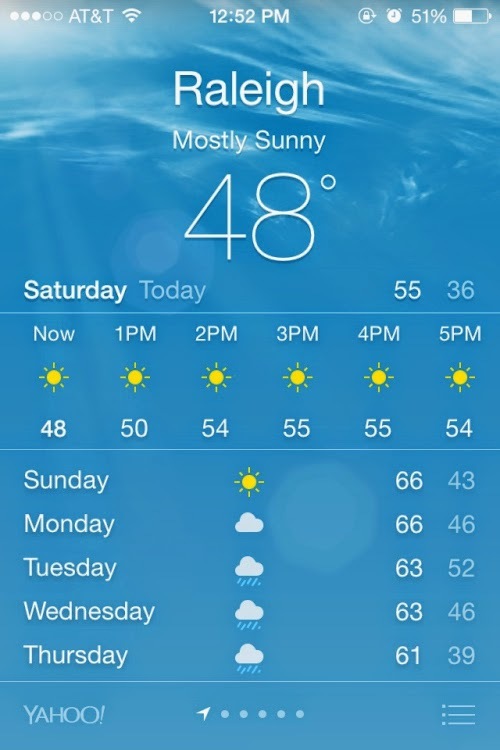 I'm always watching the Weather Channel and checking all my apps when there's a forecast for anything different. Growing up in Los Angeles, 75 degrees and sunny was the norm. Well, it sure is different here in the Old Tar Heel State. Wait 10 minutes and something different will blow in. There's not a bit of sun predicted for the entire week. So I got a little carried away this weekend with my yellows. 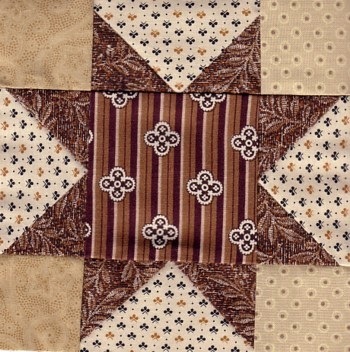 16-Patch quilts. 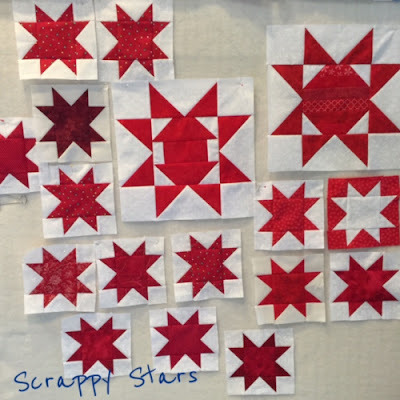 Each month I am making a 16-patch Quilt (color to be determined here) of the Scrappy Jar Stars to give away to my favorite organization which need baby quilts. 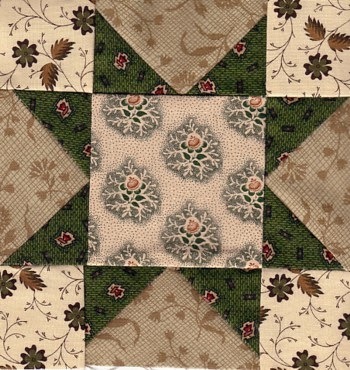 I also found an old set of blocks from the French Rose raggedy trend that was going on way back. 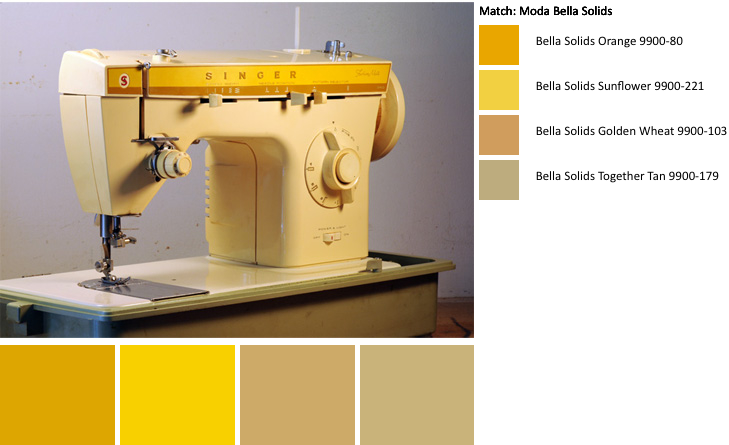 My mom had a machine something like this. Wow! I wish I had it now. Maybe it wouldn't eat all my teeny tiny points for my bitty block baskets. Play Along! It's a lot of fun.